Oxidation and reduction deals with the transferring of electrons between reactants. The reactant that loses electrons is oxidized, while the reactant that gains electrons is reduced. We're going to say chemists usually use important terminology to describe the movement of electrons. Remember, electrons are the negative sub-atomic particles. We're going to say in redox reactions, we have the movement electrons from one reactant to another reactant. We’re going to use of funny type of sentence to help us remember what's going on. The sentence is LEO, the lion, goes GER. It might sound corny, but trust me helps a lot with understanding oxidation and reduction. We said LEO, the lion, goes GER. LEO – lose electrons oxidation. Goes GER – gain electrons reduction. Remember, electrons are negatively charged. If you're losing negatively charged sub-atomic particles, you're becoming more positive. Lose electrons means you're becoming more positive. If you're gaining negative electrons, you’re gaining negative things, so you are going to become more negative. Then here's the weird thing. If you've been oxidized, if you undergo oxidation, you’re called the reducing agent. You're the reducing agent. If you've been reduced, then you’re the oxidizing agent. When in doubt about oxidation or reduction just remember the phrase: "LEO the lion goes GER." Now that we know the distinction between oxidation and reduction, it's important to set down some ground rules to help us figure out what’s the particular oxidation state on a particular element. I break rules for assigning oxidation numbers, which we’re going to abbreviate ON, so oxidation number is ON. I break it down into two sets of rules. We have our two general rules and then we have our more specific rules. The two general rules. We're going to say for an atom in its elemental form, what does elemental form mean? Elemental form means two things. It means that the metal is by itself such as sodium. Sodium metal is by itself. Or the element is connected to itself. Oxygen here is connected to another oxygen. Sulfur here is connected to a bunch of sulfurs just like itself. If you're by yourself or you’re connected to copies of yourself and you have no charge, that is your elemental form. Let's write that down. Elemental form means you are by yourself or connected to copies of yourself and you have no charge. If you fit these types of categories, then your oxidation number is equal to 0. The second general rule is for an ion, whatever the ion’s charge is, that's its oxidation number. Sodium here is by itself but it has a plus one charge, so its oxidation numbers is plus 1. Calcium is by itself but it has a plus 2 charge, so its oxidation number is plus two. NO3 minus, that’s our nitrate ion, our polyatomic ion. The oxidation number for the entire compound is negative 1. If we want to find the oxidation state of each of the individual elements, that's when we move on to our specific rules. Our specific rules, we're going to say group 1A, plus 1. Group 2A, plus 2 based on the charge distributions that we learned earlier. What we’re going to say if a hydrogen, hydrogen is in group 1A but a hydrogen is not always plus 2. We're going to say it's plus 1 when it's connected to non-metals, so if it's connected to Cl or perchlorate or in water. In these three examples, water is connected to only non-metal so it’s plus 1. But if a hydrogen is connected to a metal or boron, it’s minus 1. If we had NaH or BH3, then in those cases hydrogen would be negative 1. We’re going to say fluorine is always minus 1 no matter what. Oxygen on the other hand can be a pain because oxygen has various oxidation states. It's all based on what kind of compound it’s in. We're going to say for oxygen, when it's a peroxide, it's going to be negative 1. What exactly is a peroxide? A peroxide has the formula X2O2. X equals a group 1A element, so hydrogen, lithium, potassium – all of those are group 1A metals. A good example here, you could have hydrogen peroxide or sodium peroxide. Both are peroxides because both have the formula X2O2. In this case, oxygen would be minus 1. Oxygen will be negative a half when it’s a superoxide. A superoxide has the formula XO2. X again is a group 1A element. Example, you could have sodium superoxide or lithium superoxide. We're going to basically say if oxygen is not a peroxide or superoxide, we can say that it's -2. This is the normal state of oxygen because we seldom see peroxide or superoxide. But if we do not see one of those two, remember oxygen would be minus 2. Group 7A elements or halogens. They're going to be minus 1 except when they're connected to oxygen. When they're connected to oxygen, we're going to have to use some mathematical knowledge in order to do it. Simple algebra. We’ll get to see how this works when we do practice questions dealing with this concept. Remember, we have our two generals and then we have our more specific rules. 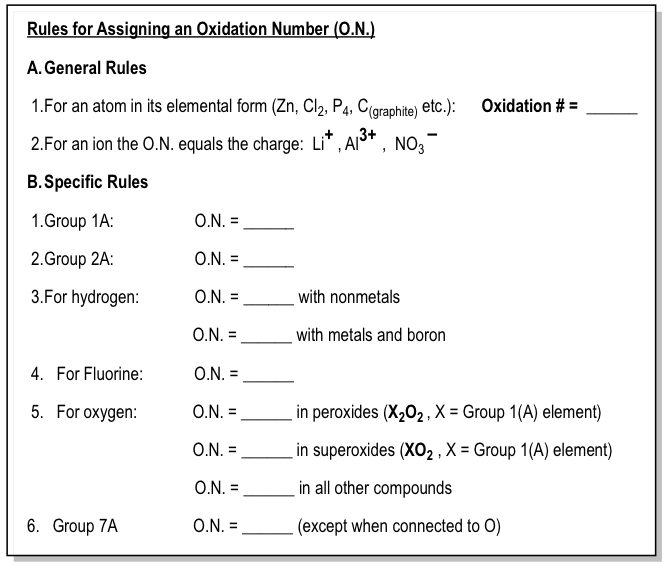 We use these oxidation number rules whenever we are asked to determine the oxidation number of an entire compound or the individual elements within a compound. Example #1: What is the oxidation number of each underlined element? Instead of being asked who is oxidized or reduced, sometimes you may be asked to determine the reducing and oxidizing agents. Example #2: In the following reaction identify the oxidizing agent and the reducing agent. Try your skills at determing the oxidation number of elements within molecules or polyatomic ions. Practice: What is the oxidation number of each underlined element? Just remember if you've been oxidized then you're the reducing agent and if you've been reduced then you're the oxidizing agent. Concept #3: OXIDATION-REDUCTION (REDOX) reactions deal with the transfer of electrons from one reaction to another. Concept #4: From our understanding of redox reactions we can draw connections to voltage, current, charge and power. Consider the following standard reduction potentials in acid solution: E°(V) Al3+ + 3e- → Al(s) - 1.66 AgBr(s) + e- → Ag(s) + Br - + 0.07 Sn4+ + 2e- → Sn2+ + 0.14 Fe3+ + e- → Fe2+ + 0.77 The strongest oxidizing agent among those shown above is A) Fe3+. B) Fe2+. C) Br -. D) Al3+. E) Al. Based on standard reduction potentials, would you expect copper metal to oxidize under standard conditions in the presence of oxygen and hydrogen ions? In the Brønsted-Lowry concept of acids and bases, acid–base reactions are viewed as proton-transfer reactions. The stronger the acid, the weaker is its conjugate base.Would strong oxidizing agents be analogous to strong acids or strong bases? Indicate whether each of the following statements is true or false.The stronger the oxidizing agent, the larger its reduction potential. Assuming standard conditions, arrange the following in order of decreasing strength as oxidizing agents in acidic solution: Cr2 O7 2 - , H2 O2 , Cu2 + , Cl2 , O2. Does a large positive electrode potential indicate a strong oxidizing agent or a strong reducing agent? What about a large negative electrode potential? Relative strengths of oxidizing and reducing agents.Can an acidic solution oxidize a piece of aluminum? Decide whether or not Au dissolves in 1 M HIO3. Decide whether or not Cr dissolves in 1 M HIO3. From each of the following pairs of substances, use data in Appendix E in the textbook to choose the one that is the stronger reducing agent.Fe(s) or Mg(s). From each of the following pairs of substances, use data in Appendix E in the textbook to choose the one that is the stronger reducing agent.Ca(s) or Al(s). From each of the following pairs of substances, use data in Appendix E in the textbook to choose the one that is the stronger reducing agent.H2 (g, acidic solution) or H2 S(g). From each of the following pairs of substances, use data in Appendix E in the textbook to choose the one that is the stronger reducing agent.BrO3- (aq) or IO3- (aq). Activity Series of Metals in Aqueous Solution Metal Oxidation Reaction Lithium Li(s) → Li+(aq) + e- r . Ease of oxidation increases Potassium K(s) → K+(aq) + e- Barium Ba(s) → Ba2+(aq) + 2e- Calcium Ca(s) → Ca2+(aq) + 2e- Sodium Na(s) → Na+(aq) + e- Magnesium Mg(s) → Mg2+(aq) + 2e- Aluminum Al(s) → Al3+(aq) + 3e- Manganese Mn(s) → Mn2+(aq) + 2e- Zinc Zn(s) → Zn2+(aq) + 2e- Chromium Cr(s) → Cr3+(aq) + 3e- Iron Fe(s) → Fe2+(aq) + 2e- Cobalt Co(s) → Co2+(aq) + 2e- Nickel Ni(s) → Ni2+(aq) + 2e- Tin Sn(s) → Sn2+(aq) + 2e- Lead Pb(s) → Pb2+(aq) + 2e- Hydrogen H2(g) → 2H+(aq) + 2e- Copper Cu(s) → Cu2+(aq) + 2e- Silver Ag(s) → Ag+(aq) + e- Mercury Hg(l) → Hg2+(aq) + 2e- Platinum Pt(s) → Pt2+(aq) + 2e- Gold Au(s) → Au3+(aq) + 3e- Based on their relative positions in table, which ion will have a more positive standard reduction potential? Mercuric oxide dry-cell batteries are often used where a high-energy density is required, such as in watches and cameras. The two half-cell reactions that occur in the battery are l HgO(s) + H2 O(l) + 2e- → Hg(l) + 2OH- (aq)Zn(s) + 2OH- (aq) → ZnO(s) + H2 O(l) + 2e- .Write the overall cell reaction. Given the following reduction half-reactions: Fe3+(aq) + e- → Fe2+(aq) Eredo= + 0.77V S2O62-(aq) + 4H+(aq) + 2e- → 2H2SO3(aq) Eredo= + 0.60V N2O(g) + 2H+(aq) + 2e- → N2(g) + H2O(l) Eredo= - 1.77V VO2+(aq) + 2H+(aq) + e- → VO2+(aq) + H2O(l) Eredo= + 1.00VWrite balanced chemical equation for the oxidation of Fe2+(aq) by S2O62- (aq). Given the following reduction half-reactions: Fe3+(aq) + e- → Fe2+(aq) Eredo= + 0.77V S2O62-(aq) + 4H+(aq) + 2e- → 2H2SO3(aq) Eredo= + 0.60V N2O(g) + 2H+(aq) + 2e- → N2(g) + H2O(l) Eredo= - 1.77V VO2+(aq) + 2H+(aq) + e- → VO2+(aq) + H2O(l) Eredo= + 1.00VWrite balanced chemical equation for the oxidation of Fe2+(aq) by N2O(g). Given the following reduction half-reactions: Fe3+(aq) + e- → Fe2+(aq) Eredo= + 0.77V S2O62-(aq) + 4H+(aq) + 2e- → 2H2SO3(aq) Eredo= + 0.60V N2O(g) + 2H+(aq) + 2e- → N2(g) + H2O(l) Eredo= - 1.77V VO2+(aq) + 2H+(aq) + e- → VO2+(aq) + H2O(l) Eredo= + 1.00VWrite balanced chemical equation for the oxidation of Fe2+(aq) by VO2+(aq). Consider the following two half reactions. Mg2+ + 2 e- → Mg(s) O2(g) + 2 H+(aq) + 2 e- → H2O2(aq) Standard electrode potentials can be found here: Table 19.1For each pair of half-reactions, write the overall balanced chemical reaction that will be spontaneous. Heart pacemakers are often powered by lithium-silver chromate "button" batteries. The overall cell reaction is: 2Li(s) + Ag2CrO4(s) → Li2CrO4(s) + 2Ag(s)Choose the two half-reactions from Appendix E in the textbook that most closely approximate the reactions that occur in the battery. Write the cathode reaction. Heart pacemakers are often powered by lithium-silver chromate "button" batteries. The overall cell reaction is: 2Li(s) + Ag2CrO4(s) → Li2CrO4(s) + 2Ag(s)Write the anode reaction. For a spontaneous reaction A(aq) + B(aq) → A-(aq) + B+(aq) answer the following questions:If you made a voltaic cell out of this reaction, what half-reaction would be occurring at the cathode, and what half-reaction would be occurring at the anode? On which side of an oxidation half-reaction do the electrons appear? A hydrogen-PEM fuel cell. The proton-exchange membrane (PEM) allows H+ ions generated by H2 oxidation at the anode to migrate to the cathode, where H2O is formed.What half-reaction occurs at the cathode? Using a library or the Internet, research a fuel cell that uses methanol for fuel. What is the reaction at the anode? For the reaction:Ni2+(aq) + Mg(s) → Ni(s) + Mg 2+(aq)a. Indicate the half-reaction occurring at Anode.b. Indicate the half-reaction occurring at Cathode.Express your answer as a chemical equation. Identify all of the phases in your answer. 2NO3-(aq) + 8H+(aq) + 3Cu(s) → 2NO(g) + 4H 2O(l) + 3Cu2+(aq) i) Indicate the half-reaction occurring at Anode. Express your answer as a chemical equation. Identify all of the phases in your answer. ii) Indicate the half-reaction occurring at Cathode. Express your answer as a chemical equation. Identify all of the phases in your answer. Rank these species by their ability to act as an oxidizing agent. Cu+, Cr2+,Cl2, Na+ Rank from best oxidizing agent to poorest oxidizing agent. Use Appendix D to create an activity series of Mn, Fe, Ag, Sn, Cr, Cu, Ba, Al, Na, Hg, Ni, Li, Au, Zn, and Pb. Rank these metals in order of decreasing reducing strength, and divide them into three groups: those that displace H2 from water, those that displace H2 from acid, and those that cannot displace H2. Gold exists in two common positive oxidation states, +1 and +3. The standard reduction potentials for these oxidation states areAu+ ( aq ) + e- → Au ( s ) Eredo= + 1.69 VAu3 + ( aq ) + 3e- → Au( s ) Eredo= + 1.50 VMiners obtain gold by soaking gold-containing ores in an aqueous solution of sodium cyanide. A very soluble complex ion of gold forms in the aqueous solution because of the redox reaction4 Au ( s ) + 8 NaCN ( aq ) + 2 H2O( l ) + O2 ( g ) → 4 Na[Au(CN)2]( aq ) + 4 NaOH ( aq )What is being oxidized in this reaction? Gold exists in two common positive oxidation states, +1 and +3. The standard reduction potentials for these oxidation states areAu+ ( aq ) + e- → Au ( s ) Eredo= + 1.69 VAu3 + ( aq ) + 3e- → Au( s ) Eredo= + 1.50 VWhat is being oxidized? Gold exists in two common positive oxidation states, +1 and +3. The standard reduction potentials for these oxidation states areAu+ ( aq ) + e- → Au ( s ) Eredo= + 1.69 VAu3 + ( aq ) + 3e- → Au( s ) Eredo= + 1.50 VSuggest several substances that should be strong enough oxidizing agents to oxidize gold metal. Using a table of standard reduction potentials, select the following elements that are capable of oxidizing Fe2+(aq) ions to Fe3+(aq) ions: oxygen, chlorine, bromine, iodine? You may want to reference (Pages 860 - 867)Section 20.4 while completing this problem.Based on the data in Appendix E in the textbook, which of the following is the weakest oxidizing agent in acidic solution: Br2, H2O2, Zn, Cr2O72-? You may want to reference (Pages 860 - 867)Section 20.4 while completing this problem.Based on the data in Appendix E in the textbook, which of the following is the strongest oxidizing agent in acidic solution: Br2, H2O2, Zn, Cr2O72-? The standard reduction potential for the reduction of RuO4 - (aq) to RuO4 2 - (aq) is +0.59 V.Use Appendix E in the textbook. Which of the following substances can oxidize RuO4 2 - (aq) to RuO4 - (aq) under standard conditions: Br2 (l), BrO3- (aq), Mn2+ (aq), O2 (g), Sn2+ (aq)? Answer the following questions using data from Table 17‑1 (all under standard conditions).a. Is H+ (aq) capable of oxidizing Cu (s) to Cu 2+ (aq)? Answer the following questions using data from Table 17‑1 (all under standard conditions).b. Is Fe3+(aq) capable of oxidizing I -(aq)? Consider only the species (at standard conditions)Na+, Cl -, Ag+, Ag, Zn2+, Zn, Pbin answering the following questions. Give reasons for your answers. (Use data from Table 17‑1.)a. Which is the strongest oxidizing agent? Consider only the species (at standard conditions)Na+, Cl -, Ag+, Ag, Zn2+, Zn, Pbin answering the following questions. Give reasons for your answers. (Use data from Table 17‑1.)c. Which species can be oxidized by SO 42-(aq) in acid? Consider only the species (at standard conditions)Br -, Br2, H+, H2, La3+, Ca, Cdin answering the following questions. Give reasons for your answers. (Use data from Table 17‑1.)a. Which is the strongest oxidizing agent? Consider only the species (at standard conditions)Br -, Br2, H+, H2, La3+, Ca, Cdin answering the following questions. Give reasons for your answers. (Use data from Table 17‑1.)c. Which species can be oxidized by MnO 4- in acid? When aluminum foil is placed in hydrochloric acid, nothing happens for the first 30 seconds or so. This is followed by vigorous bubbling and the eventual disappearance of the foil. Explain these observations. How can Table 19.1 be used to predict whether or not a metal will dissolve in HCl? In HNO3? Consider the following half-reactions:Pt2+ + 2e- → Pt E° = 1.188 VPtCl42- + 2e- → Pt + 4Cl - E° = 0.755 VNO3- + 4H+ + 3e- → NO + 2H 2O E° = 0.96 VExplain why platinum metal will dissolve in aqua regia (a mixture of hydrochloric and nitric acids) but not in either concentrated nitric or concentrated hydrochloric acid individually. Gold exists in two common positive oxidation states, +1 and +3. The standard reduction potentials for these oxidation states areAu+ ( aq ) + e- → Au ( s ) Eredo= + 1.69 VAu3 + ( aq ) + 3e- → Au( s ) Eredo= + 1.50 VWhat is being reduced in this reaction? Gold exists in two common positive oxidation states, +1 and +3. The standard reduction potentials for these oxidation states areAu+ ( aq ) + e- → Au ( s ) Eredo= + 1.69 VAu3 + ( aq ) + 3e- → Au( s ) Eredo= + 1.50 VWhat is being reduced? Consider the following metals: Ag, Au, Mg, Ni, and Zn. Which of these metals could be used as a sacrificial anode in the cathodic protection of an underground steel storage tank? Steel is mostly iron, so use −0.447 V as the standard reduction potential for steel. Why would a sacrificial anode made of lithium metal be a bad choice despite its E°Li+/Li = −3.04 V, which appears to be able to protect all the other metals listed in the standard reduction potential table? Arrange the following in order of decreasing strength as reducing agents in acidic solution: Zn, I- , Sn2 +, H2O2, Al. Determine whether HI can dissolve 2.20 g Al. The standard reduction potential for the reduction of Eu3 + (aq) to Eu2 + (aq) is -0.43 V. Using Appendix E in the textbook, which of the following substances is capable of reducing Eu3 + (aq) to Eu2 + (aq) under standard conditions: Al, Co, H2O2, N2H5+, H2C2O4? Determine whether HI can dissolve 4.85 g Cu. Determine whether HI can dissolve 2.42 g Ag. Determine if HNO3 can dissolve each of the following metal samples. Write a balanced chemical reaction showing how the 2.50 g Cu dissolves in HNO3. Determine if HNO3 can dissolve each of the following metal samples. Write a balanced chemical reaction showing how the 4.78 g Sn dissolves in HNO3. Which of the following is the strongest reducing agent in acidic solution: F-, Zn, N2 H5+ , I2, NO? Which of the following is the weakest reducing agent in acidic solution: F-, Zn, N2 H5+ , I2, NO? Answer the following questions using data from Table 17‑1 (all under standard conditions).c. Is H2(g) capable of reducing Ag+(aq)? Answer the following questions using data from Table 17‑1 (all under standard conditions).a. Is H2(g) capable of reducing Ni 2+(aq)? Answer the following questions using data from Table 17‑1 (all under standard conditions).b. Is Fe2+(aq) capable of reducing VO 2+(aq)? Answer the following questions using data from Table 17‑1 (all under standard conditions).c. Is Fe2+(aq) capable of reducing Cr 3+(aq) to Cr 2+(aq)? Consider only the species (at standard conditions)Na+, Cl -, Ag+, Ag, Zn2+, Zn, Pbin answering the following questions. Give reasons for your answers. (Use data from Table 17‑1.)b. Which is the strongest reducing agent? Consider only the species (at standard conditions)Na+, Cl -, Ag+, Ag, Zn2+, Zn, Pbin answering the following questions. Give reasons for your answers. (Use data from Table 17‑1.)d. Which species can be reduced by Al(s)? Consider only the species (at standard conditions)Br -, Br2, H+, H2, La3+, Ca, Cdin answering the following questions. Give reasons for your answers. (Use data from Table 17‑1.)b. Which is the strongest reducing agent? Consider only the species (at standard conditions)Br -, Br2, H+, H2, La3+, Ca, Cdin answering the following questions. Give reasons for your answers. (Use data from Table 17‑1.)d. Which species can be reduced by Zn(s)? When metal A is placed in a solution of a salt of metal B, the surface of metal A changes color. When metal B is placed in acid solution, gas bubbles form on the surface of the metal. When metal A is placed in a solution of a salt of metal C, no change is observed in the solution or on the surface of metal A. (a) Will metal C cause formation of H2 when placed in acid solution? When metal A is placed in a solution of a salt of metal B, the surface of metal A changes color. When metal B is placed in acid solution, gas bubbles form on the surface of the metal. When metal A is placed in a solution of a salt of metal C, no change is observed in the solution or on the surface of metal A. (b) Rank metals A, B, and C in order of decreasing reducing strength. When a clean iron nail is placed in an aqueous solution of copper(II) sulfate, the nail becomes coated with a brownish-black material. (b) What are the oxidizing and reducing agents? Which metal could you use to reduce Mn2+ ions but not Mg2+ ions? Bubbles of H2 form when metal D is placed in hot H 2O. No reaction occurs when D is placed in a solution of a salt of metal E, but D is discolored and coated immediately when placed in a solution of a salt of metal F. What happens if E is placed in a solution of a salt of metal F? Rank metals D, E, and F in order of increasing reducing strength. A voltaic cell similar to that shown in Figure 20.5 in the textbook is constructed. One electrode compartment consists of a silver strip placed in a solution of AgNO3, and the other has an iron strip placed in a solution of FeCl2. The overall cell reaction isFe(s) + 2Ag+(aq) → Fe2+(aq) + 2Ag(s)Write the half-reaction that occurs at the anode. A voltaic cell similar to that shown in Figure 20.5 in the textbook is constructed. One electrode compartment consists of a silver strip placed in a solution of AgNO3, and the other has an iron strip placed in a solution of FeCl2. The overall cell reaction isFe(s) + 2Ag+(aq) → Fe2+(aq) + 2Ag(s)Write the half-reaction that occurs at the cathode. A voltaic cell is constructed. One electrode compartment consists of an aluminum strip placed in a solution of Al ( NO3 )3, and the other has a nickel strip placed in a solution of NiSO4. The overall cell reaction is2Al(s) + 3Ni2+(aq) → 2Al3+(aq) + 3Ni(s)Write the half-reaction that occurs at the anode. A voltaic cell is constructed. One electrode compartment consists of an aluminum strip placed in a solution of Al ( NO3 )3, and the other has a nickel strip placed in a solution of NiSO4. The overall cell reaction is2Al(s) + 3Ni2+(aq) → 2Al3+(aq) + 3Ni(s)Write the half-reaction that occurs at the cathode. A voltaic cell that uses the reactionTl3 + ( aq ) + 2Cr2 + ( aq ) → Ti+ ( aq ) + 2Cr3 + ( aq )has a measured standard cell potential of +1.19 V.Write the two half-cell reactions. A voltaic cell that uses the reactionPdCl42-(aq) + Cd(s) → Pd(s) + 4Cl-(aq) + Cd2+(aq)has a measured standard cell potential of +1.03 V.Write the half-cell reaction at the cathode. A voltaic cell that uses the reactionPdCl42-(aq) + Cd(s) → Pd(s) + 4Cl-(aq) + Cd2+(aq)has a measured standard cell potential of +1.03 V.Write the half-cell reaction at the anode. Write the anode reaction that cause the corrosion of iron metal to aqueous iron(II). Write the balanced half-reaction corresponding to the oxidation involved in the air oxidation of Fe2+(aq) to Fe2O3•3H2O(s). Write the cathode reaction that cause the corrosion of iron metal to aqueous iron(II). Write the balanced half-reaction corresponding to the reduction involved in the air oxidation of Fe2+(aq) to Fe2O3 3H2O. Consider a battery with the overall reaction: Cu(s) + 2Ag +(aq) ⟶ 2Ag(s) + Cu 2+(aq). (a) What is the reaction at the anode and cathode? Two voltaic cells are to be joined so that one will run the other as an electrolytic cell. In the first cell, one half-cell has Au foil in 1.00 M Au(NO3)3, and the other half-cell has a Cr bar in 1.00 M Cr(NO3)3. In the second cell, one half-cell has a Co bar in 1.00 M Co(NO 3)2, and the other half-cell has a Zn bar in 1.00 M Zn(NO3)2. (d) Which metal ion is being reduced in each cell? On which side of a reduction half-reaction do the electrons appear? The amount of manganese in steel is determined by changing it to permanganate ion. The steel is first dissolved in nitric acid, producing Mn2+ ions. These ions are then oxidized to the deeply colored MnO4- ions by periodate ion (IO4-) in acid solution.a. Complete and balance an equation describing each of the above reactions. Consider the following balanced redox reaction:2CrO2−(aq) + 2H2O(l) + 6ClO−(aq) ⟶ 2CrO42−(aq) + 3Cl2(g) + 4OH−(aq)(a) Which species is being oxidized? Consider the following balanced redox reaction:2CrO2−(aq) + 2H2O(l) + 6ClO−(aq) ⟶ 2CrO42−(aq) + 3Cl2(g) + 4OH−(aq)(b) Which species is being reduced? Consider the following balanced redox reaction:2CrO2−(aq) + 2H2O(l) + 6ClO−(aq) ⟶ 2CrO42−(aq) + 3Cl2(g) + 4OH−(aq)(c) Which species is the oxidizing agent? Consider the following balanced redox reaction:2CrO2−(aq) + 2H2O(l) + 6ClO−(aq) ⟶ 2CrO42−(aq) + 3Cl2(g) + 4OH−(aq)(d) Which species is the reducing agent? Consider the following balanced redox reaction:2CrO2−(aq) + 2H2O(l) + 6ClO−(aq) ⟶ 2CrO42−(aq) + 3Cl2(g) + 4OH−(aq)(e) From which species to which does electron transfer occur? Using a library or the Internet, research a fuel cell that uses methanol for fuel. What is the reaction at the cathode? 2I- + Cl2 → I2 + 2Cl-In the above redox reaction, use oxidation numbers to identify the element oxidized, the element reduced, the oxidizing agent and the reducing agent. Cr3+ + 3Cu+ → 3Cu2+ + CrIn the above redox reaction, use oxidation numbers to identify the element oxidized, the element reduced, the oxidizing agent and the reducing agent. Ag2O + Cu + H2O → 2Ag + Cu(OH)2In the above redox reaction, use oxidation numbers to identify the element oxidized, the element reduced, the oxidizing agent and the reducing agent. Study this chemical reaction: Pt + O2 → PtO2 Then, write balanced half-reactions describing the oxidation and reduction that happen in this reaction. Which of the following is the weakest oxidizing agent?